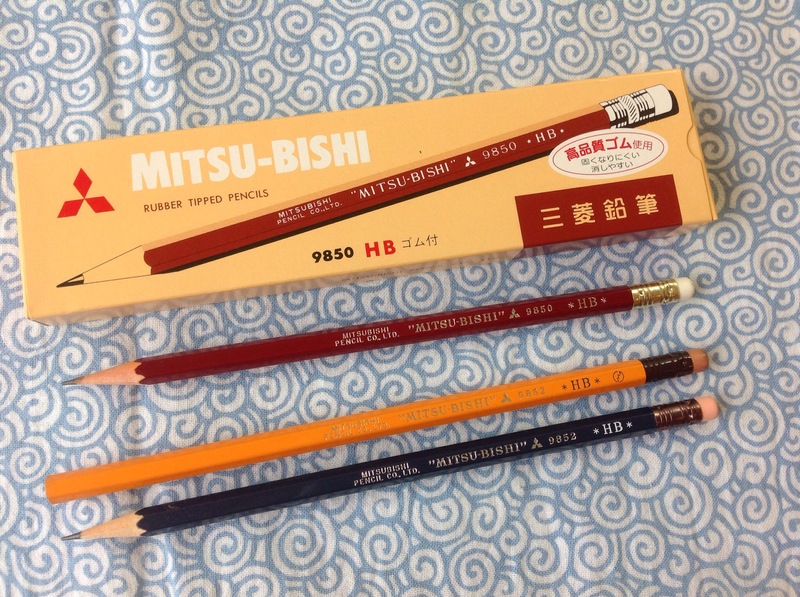 This was my haul for National Pencil Day (surely foreigners can celebrate too?). 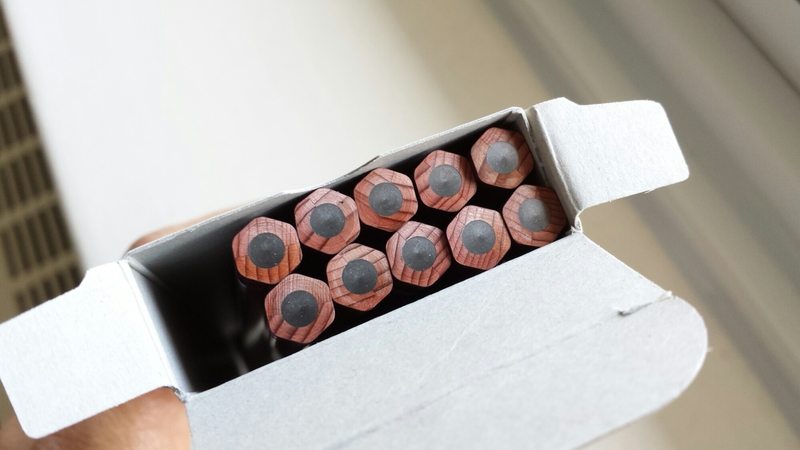 I seem to be on a roll regarding colored pencils these days, but the truth is I don’t use them much. I try, though. And I keep on buying them compulsively. 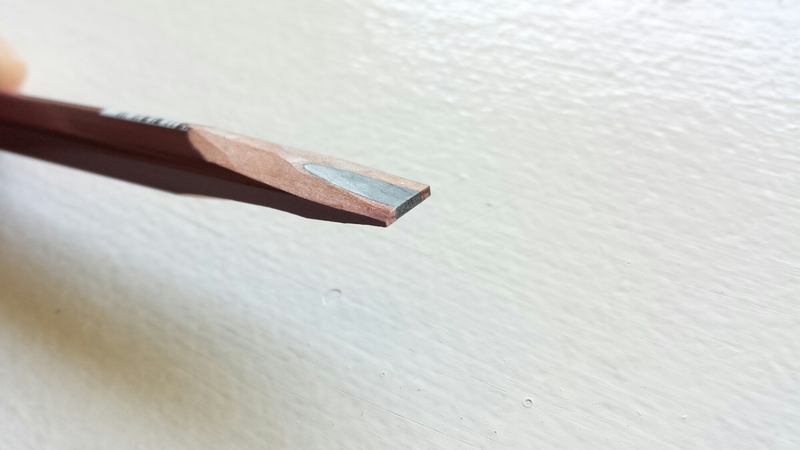 I left the two reds in the sharpened condition they came in; I sharpened the rest with the Deli 0635, which my son calls the “kitty sharpener” and which I use for almost everything these days. 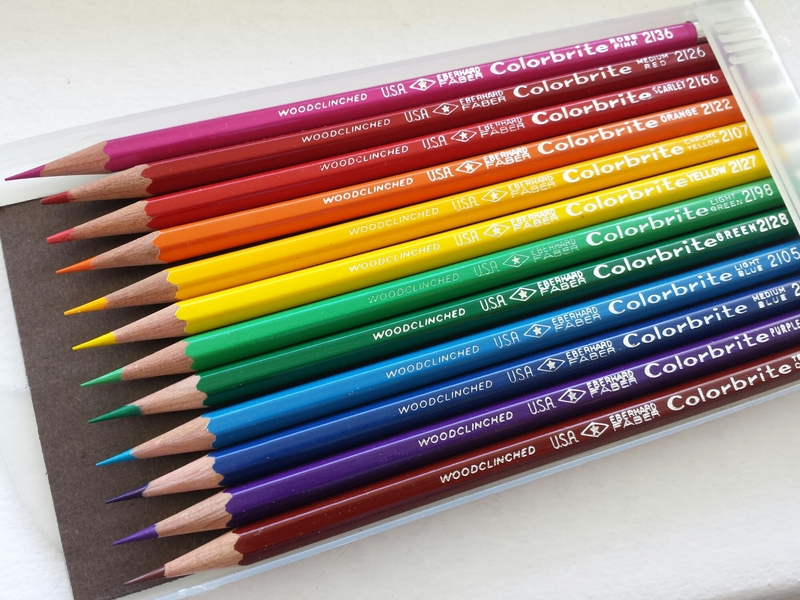 Colored pencils are, in general, better sharpened with handheld devices because they have thicker and softer cores, but the Colorbrite core is thinner and harder so sharpening with crank sharpeners is not a problem. 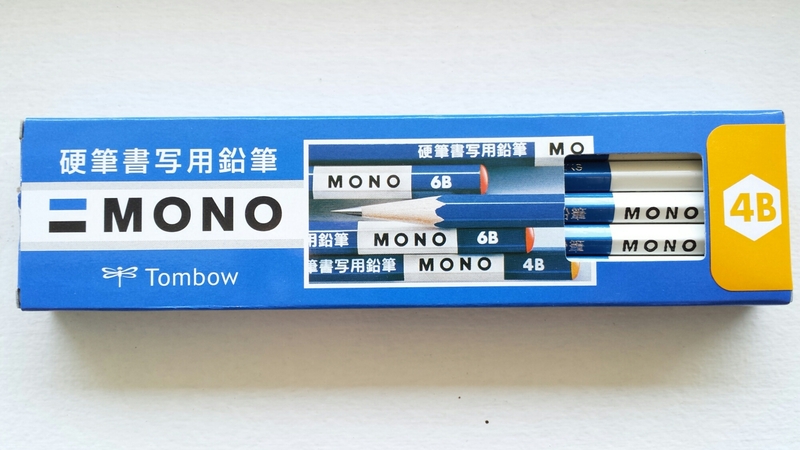 The Colorbrites write very similar to the EF Mongol Red-and-Blue 860, so I would guess the formula is more or less the same. 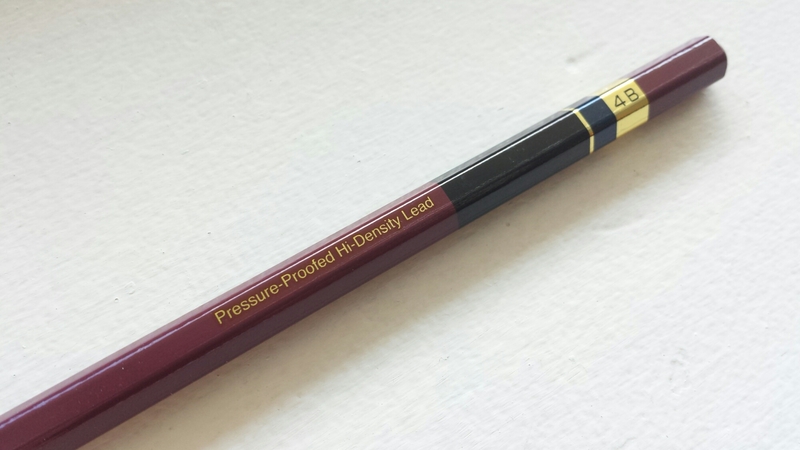 The lead has some drag to it (some colors more than others), but on the other hand it is stronger and keeps its point longer than other colored pencils that write more pleasantly. 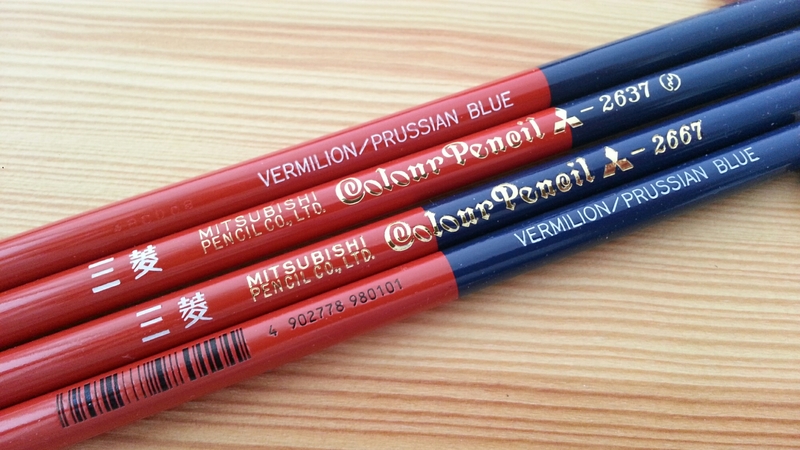 I tried some old Mitsubishi Polycolor pencils for comparison (they write with much less drag) and some tips broke upon impact – so maybe this is a necessary evil? 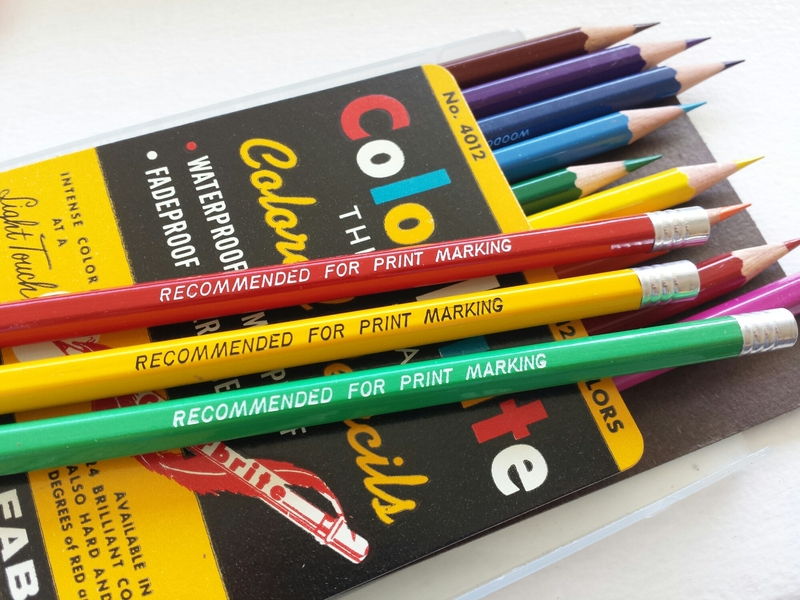 There are two interesting things about this set: one is that three pencils carry this “Recommended for Print Marking” legend. The others don’t. The other thing I noticed is that the colors contained in this vintage set seem to be a bit different compared to sets that are currently available. With smaller sets there are probably some hard decisions to make regarding what colors to put in and what to leave out, and I find the differences between past and present “standard” color selections very interesting. 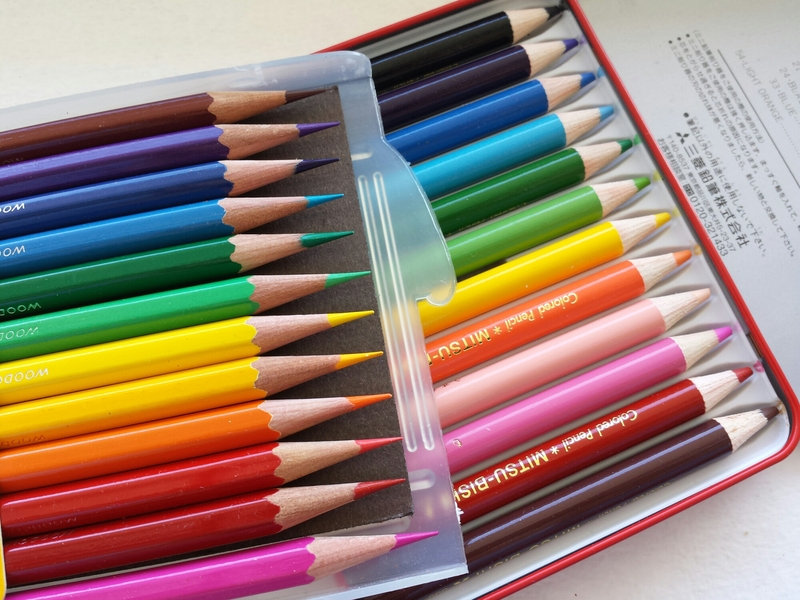 I present below, from left to right, the Eberhard Faber Colorbrite (12 colors), the Staedtler Noris Club Jumbo (10), and the Faber-Castell Jumbo (10) color pencils for comparison. 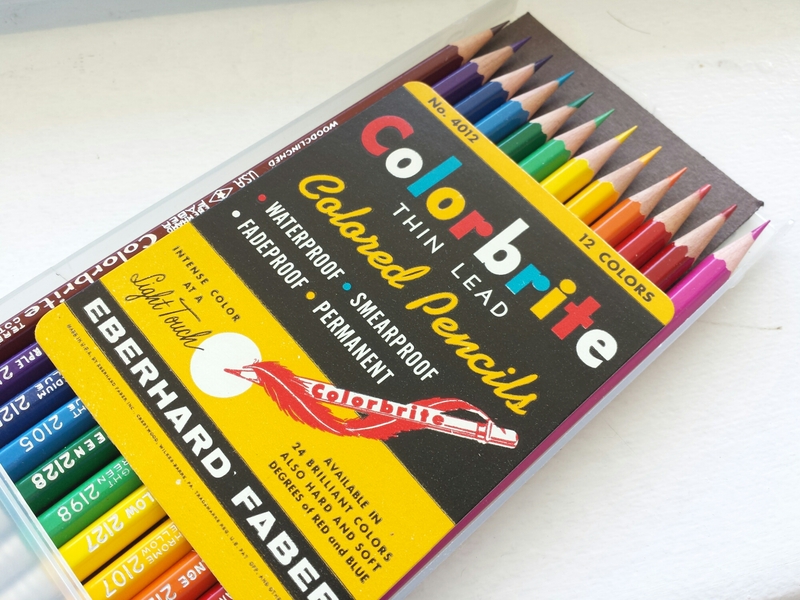 Even with two extra colors, the Colorbrite doesn’t have black. It has two yellows and two reds though (the “scarlet” is closer to vermilion), and a pink, which in modern sets doesn’t usually get a chance till you pass the 18+ mark (maybe because boys famously never use it?). It also very generously allows for a minty light green. 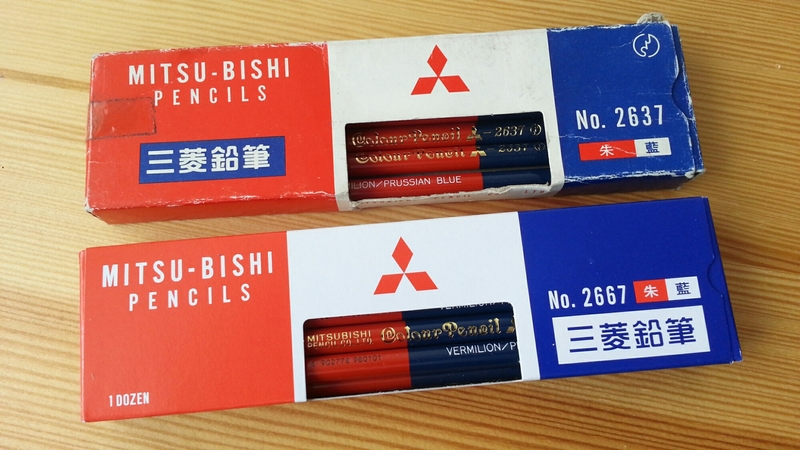 The Colorbrite has more affinities with the Mitsubishi No. 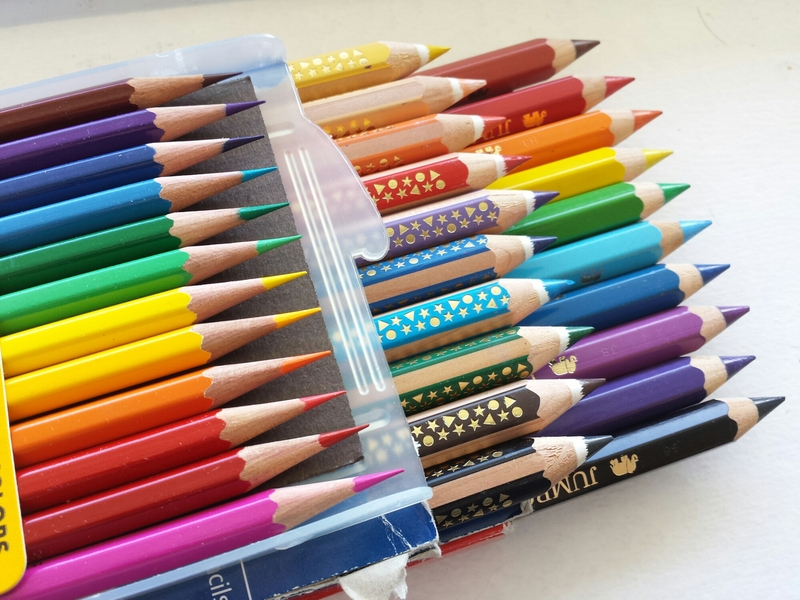 880 Mini colored pencil set. Maybe the difference stems from the fact that the Colorbrite is more of a “writing” pencil (hard, waterproof, smearproof etc.) 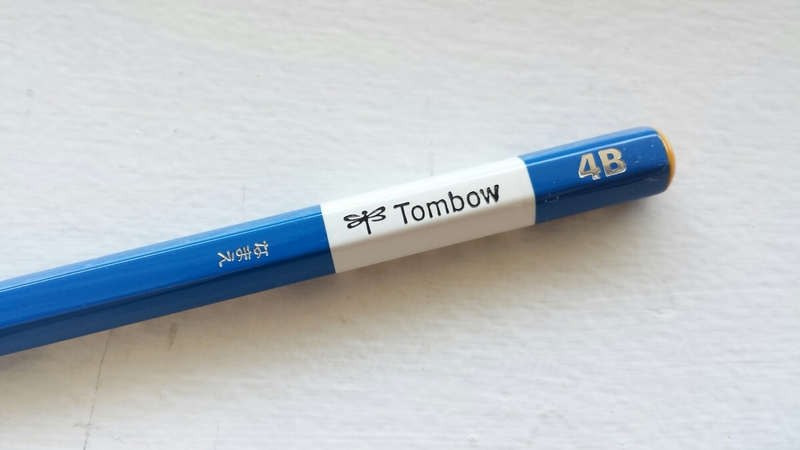 than a coloring pencil? By the way the color selection in the higher-end Van Dyke line is also very interesting. Hot pink there too! 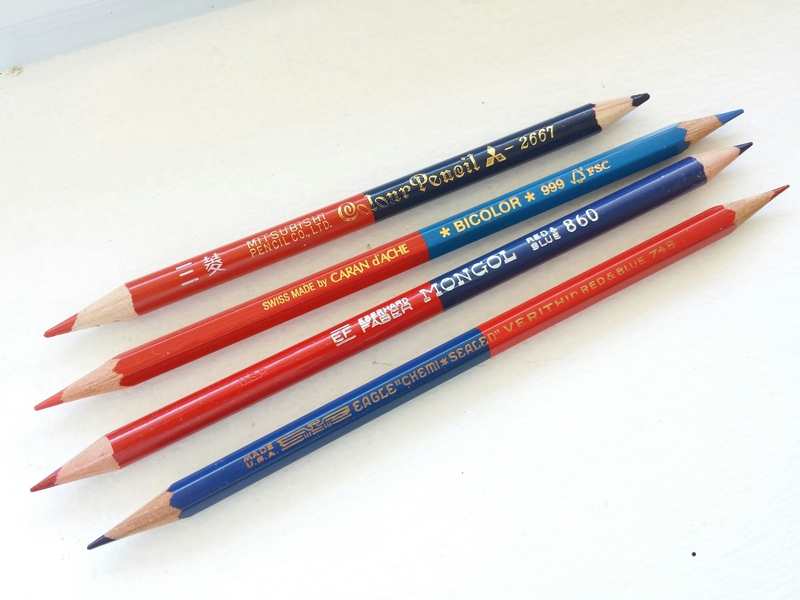 Since my last post on red-and-blue pencils, I’ve had a chance to try some others. 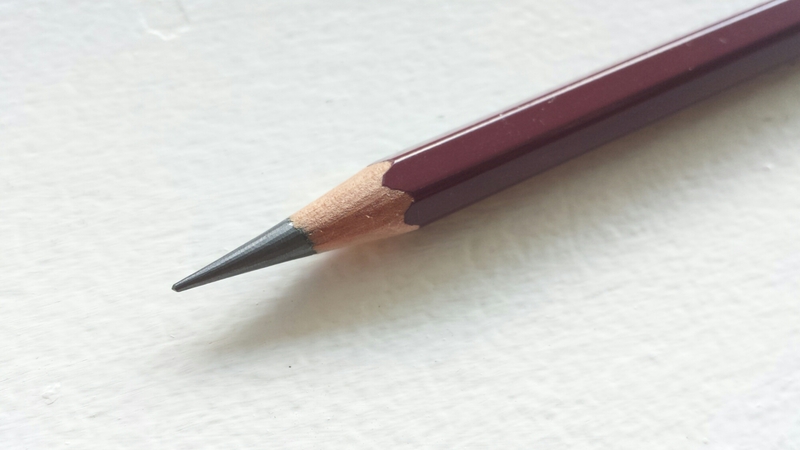 The Caran d’Ache Bicolor 999 could almost be a hexagonal variation of the Mitsubishi 2667; the red, leaning heavily towards an orangey vermilion, is very similar, as is the texture of the lead, although the Mitsubishi feels slightly softer. 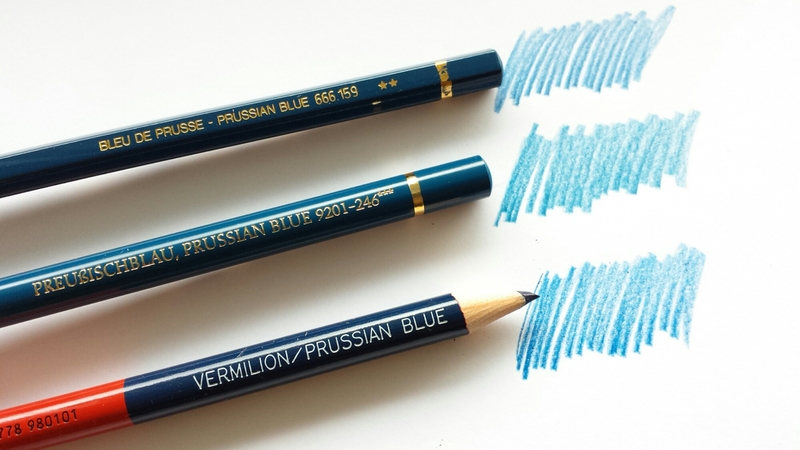 (The blue of the CdA Bicolor is a much brighter cerulean though.) 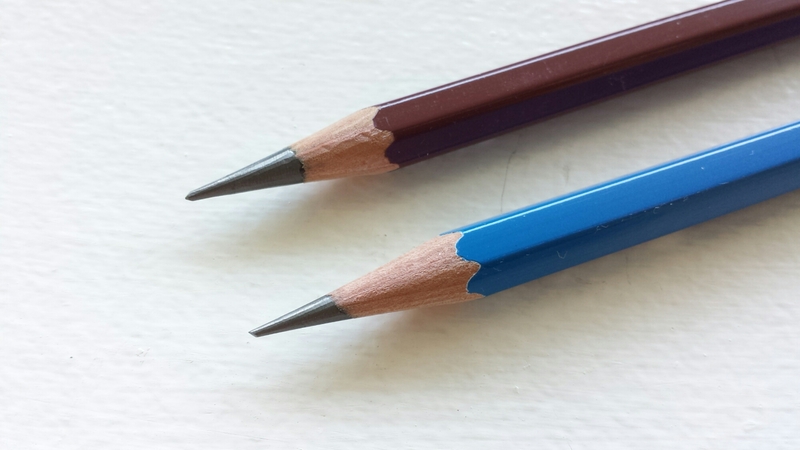 Eberhard Faber seems to have had a very different idea of the definition of “red” – theirs is a bright rose, and the blue is a violet-tinged navy too. I confess I was secretly rooting for the Eagle Verithin 748, Eagle being my favorite vintage brand, but it turned out to be a case of Stiftschmerz – the colors are all right, the red being closer to a true crimson than the others, but unfortunately it has a high-pitched noise that can make writing a bit unpleasant. My vote (within this selection) goes to the Eberhard Faber Mongol 860. 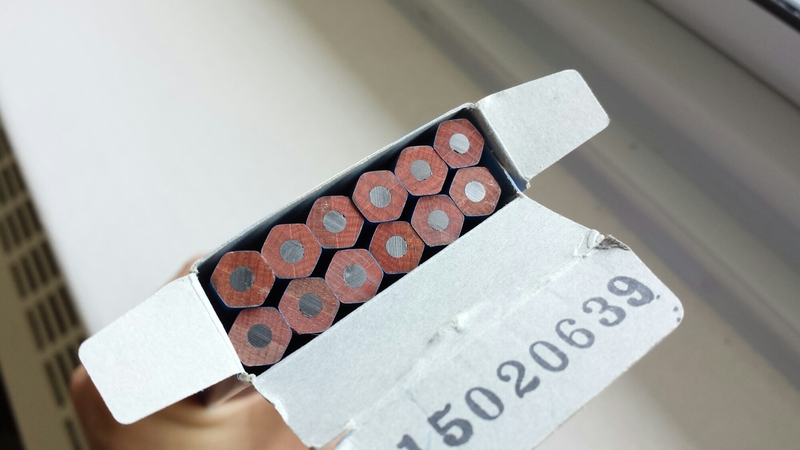 On the older box there is a JIS mark in front (discussed in an earlier post), and the price (600 yen) is noted at the back. 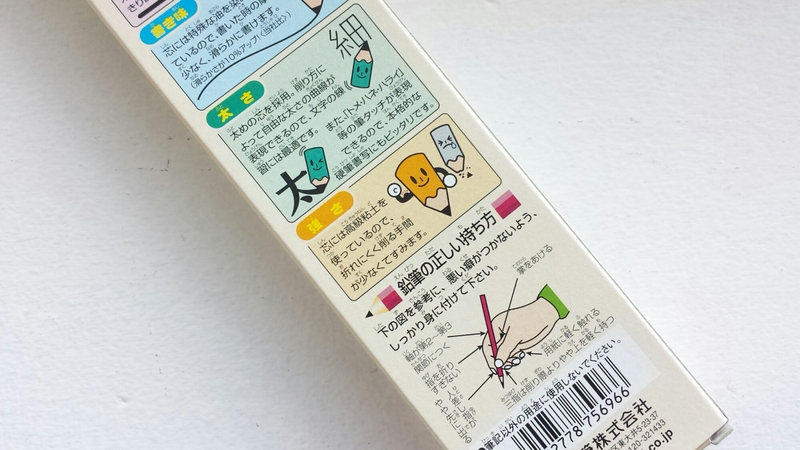 It was for a long time standard practice in Japan to mark the retail price of a product on the packaging, the numerals encased in a rectangle like this (though it is starting to disappear). 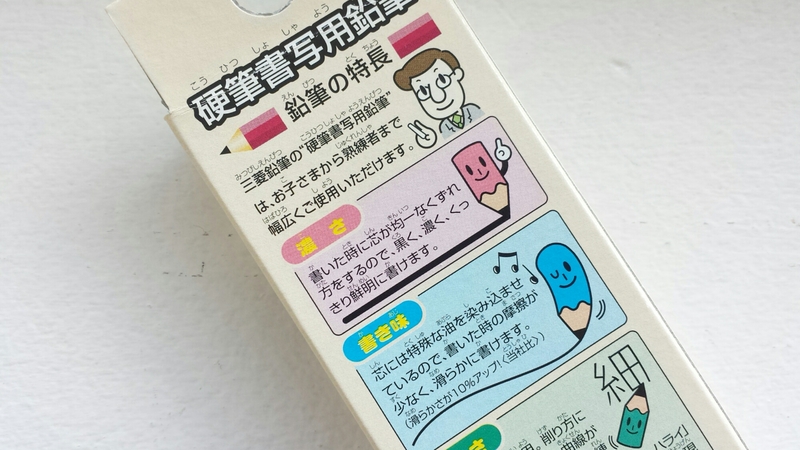 On the newer box you have the now ubiquitous barcode, the recycling symbol for paper products and a note saying that the carton was made using recycled paper. 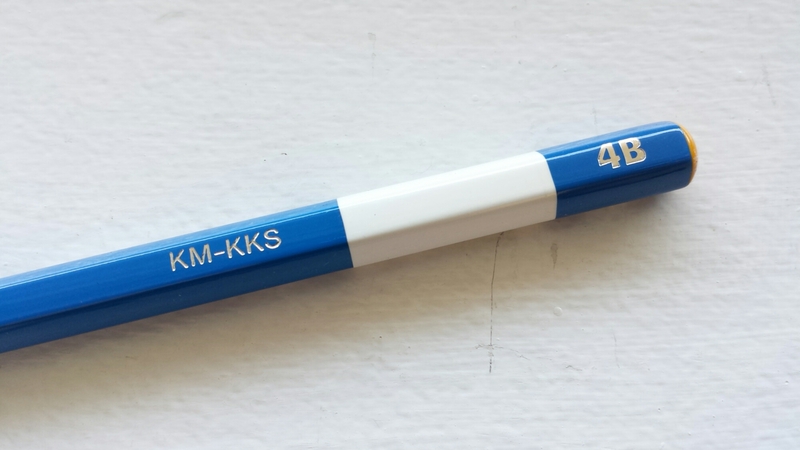 The imprint on the pencil is remarkably similar – well, the letters on the modern version are infinitesimally thicker. 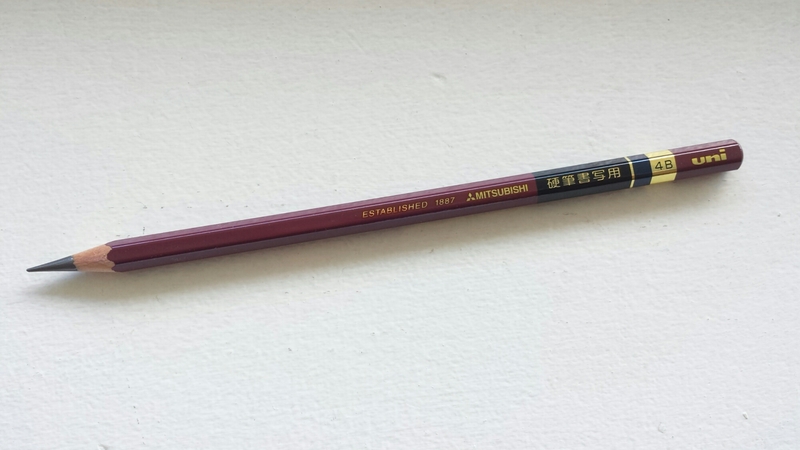 I so want to say that the new pencil writes as well as the old one, but surprisingly, I do notice some differences. The wood has become whiter. 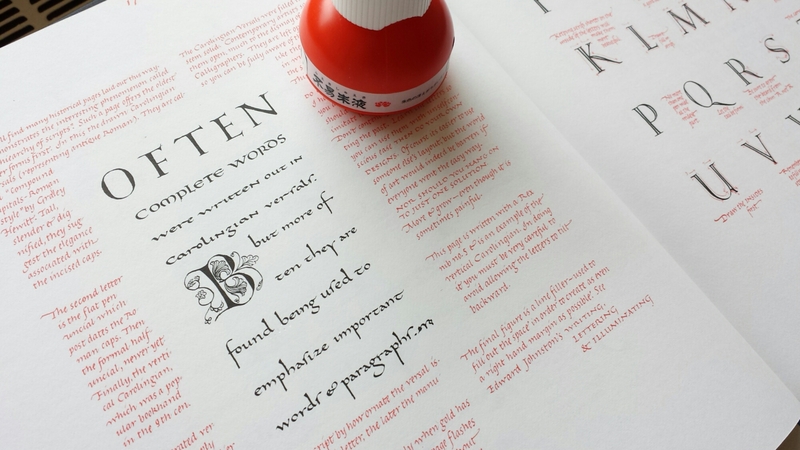 The vermilion lead is harder, lighter and noisier, although it still writes well. The Prussian blue on the other hand has not changed much, it is still satisfyingly dark, but, again, makes more noise. 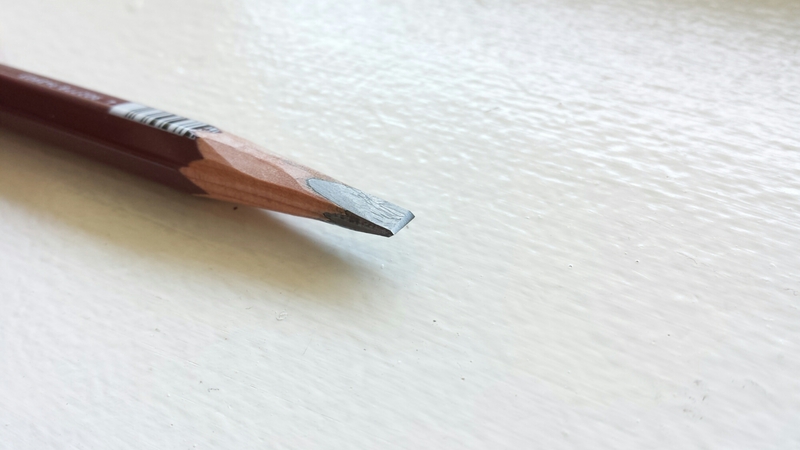 Seems like I should save the old pencils. 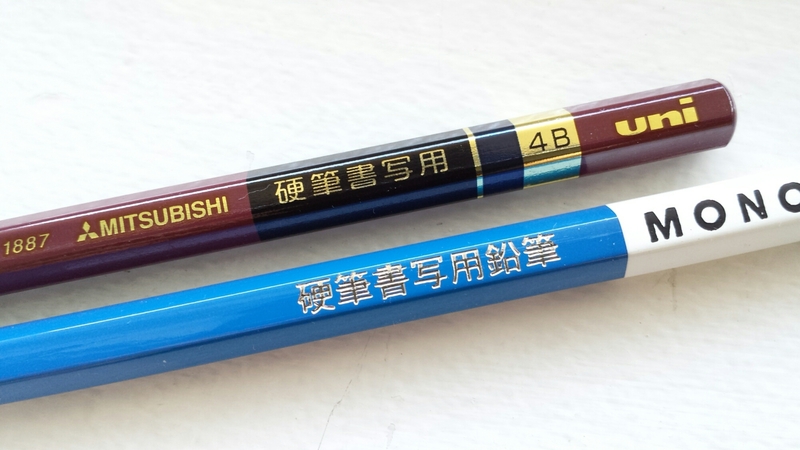 Two office-grade pencils I’ve discovered fairly recently are the Mitsubishi 9850 and the Tombow 2558. 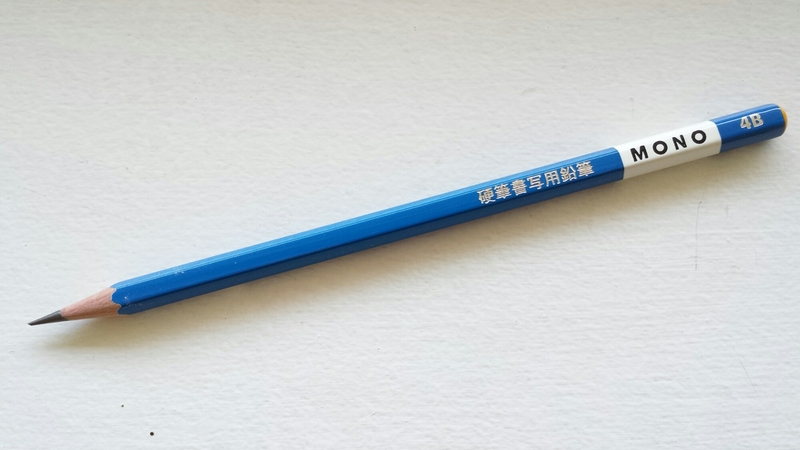 In Japan they cost about 50 cents each or less, occupying the lowest end of the quality-pencil cost spectrum. 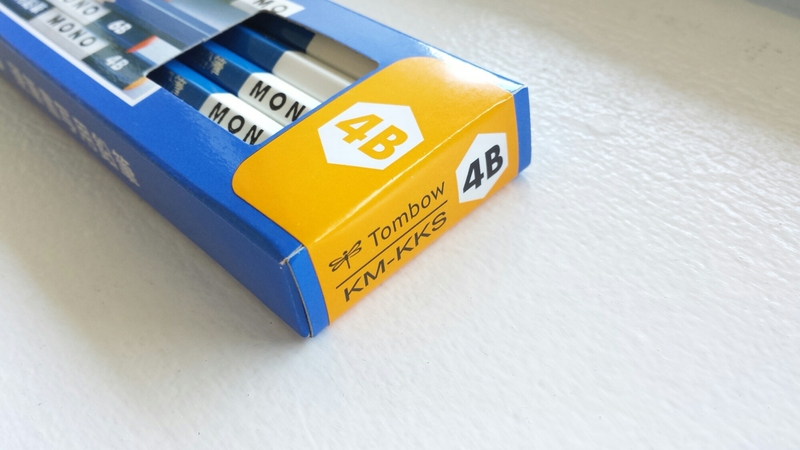 They are not THE cheapest pencils that Mitsubishi and Tombow produce (for example, the Mitsubishi 9800 and the Tombow Mono J, 8900, and Ki-monogatari pencils are cheaper) but they remain very affordable and is possessed of a quality that is way over what their price sticker may suggest. I personally don’t derive that much satisfaction from either the Hi-Uni or the Mono 100, but am bowled over every time I use either the 9850 or the 2558. Of the two, if forced to choose I would opt for the Mitsubishi 9850. I have more affection for the brand itself, and I love the color (a very unusual reddish burgundy), the precise silver lettering, and even the slightly raised barcode in white. 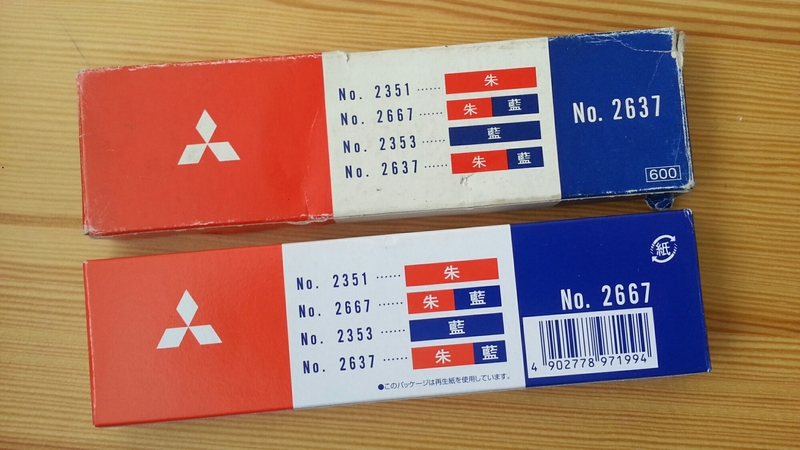 There is another model with a slightly different number, the 9852, that has been in production for almost sixty years and which Mitsubishi has been commemorating this year in limited editions of four additional colors (I got the navy blue as a gift from a friend – thank you BM!). However I don’t think the lead in the 9852 is identical to the 9850, which I find more satisfying. 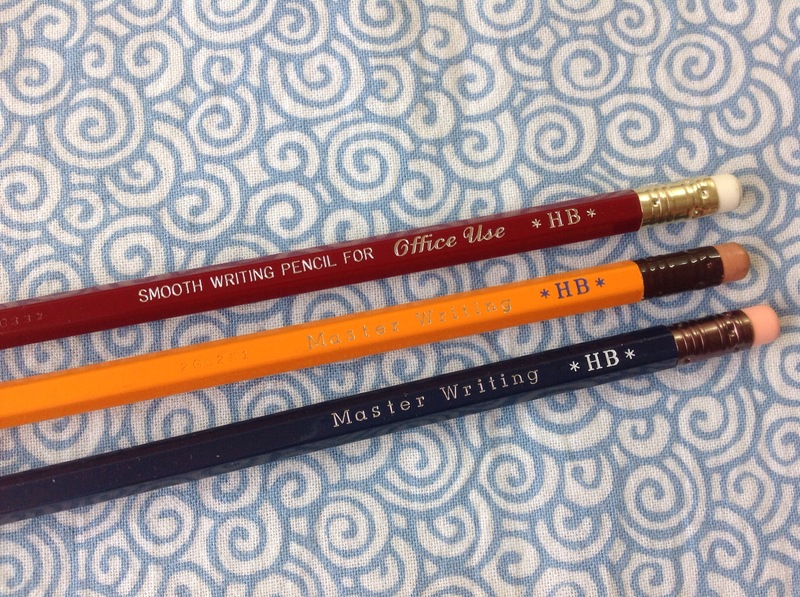 Maybe the legend – “for office use” vs. “master writing” – really do point to differences in the formula? 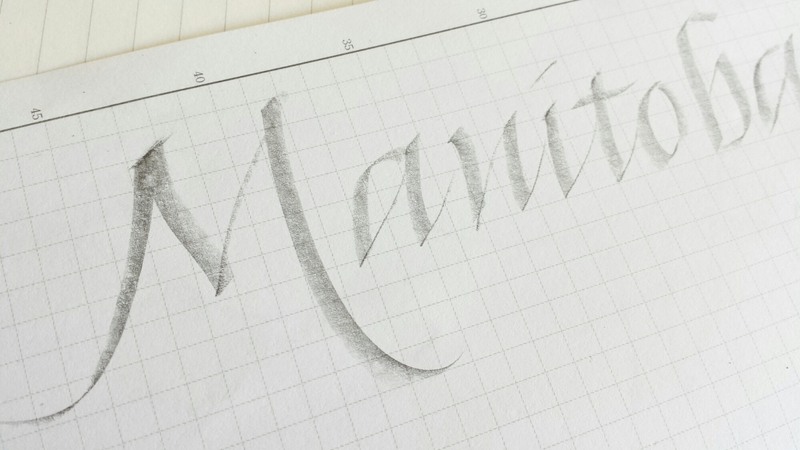 That said, there are days when I do feel the Tombow 2558 glides better on the page. 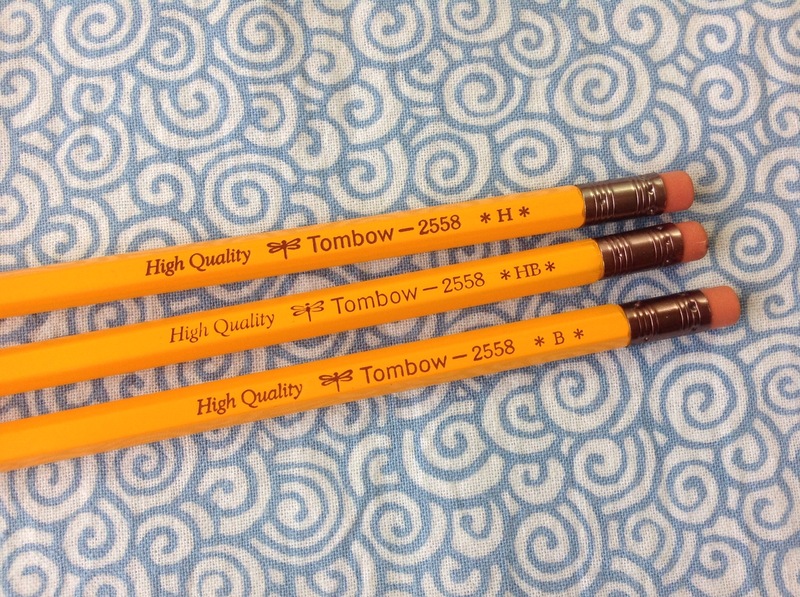 The Tombow is not very lovable, at least to me – it has the kind of color that belongs on an American pencil, not a Japanese one, the imprint can be uneven, and the ferrule is dull compared to the 9850’s bright silver with rounded white eraser. However, it writes well, so well in fact that I was tempted to try the H and B grades too. While I still feel that the HB is best, the H is also a good choice. It writes very clean. 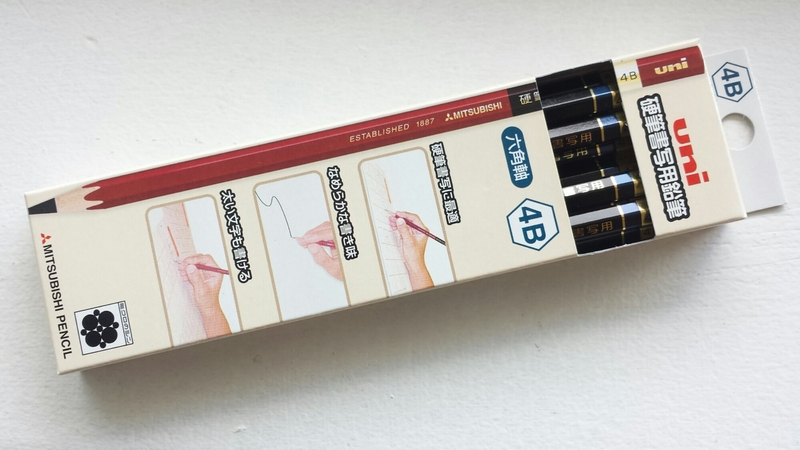 The B grade was a surprise though – not in terms of quality (which is predictably good), but because it reminded me so much of the Palomino Blackwing from the very first stroke. Could it be…?